The concept art for Elizabeth Banks' Rita Repulsa, the original Green Ranger, has been shared online and it gives a better look at what was briefly shown in the Power Rangers reboot. The movie was a moderate success at the box office though probably not what Lionsgate Films was expecting when they launched the movie. It still made enough money to recoup, which is always good. The Power Rangers reboot received mixed critical reviews by many hoping for some of the campy fun from the original TV series, but fans have slowly started to come around to the reboot with many looking forward to a sequel. Weta Workshop created the suits for Power Rangers and they recently announced that they will be having a special presentation at San Diego Comic-Con this year where fans will be able to get up close and personal with the Red Ranger's suit. To celebrate the announcement, the concept art for Rita's Green suit was unveiled through artist Lindsey Crums' Instagram. In the caption below the photos, Crums talks about the work that went into the costume. She explains. "My render of the Green Ranger! Another designer and myself passed these sculpts back and forth working together, and heaps of talented people added ideas to what became the final suits. Design is a very collaborative process! She was barely seen before she turned into Rita Repulsa in the film, but here she is!" Rita Repulsa was the original Green Ranger in the movie who turned on Zordon and the rest of the original team, betraying them millions of years before the events of the movie. Rita's Green Ranger was barely seen in the Power Rangers movie, so this is a treat for fans that wanted a closer look at the Green Ranger suit. There's clearly some more dragon type design around the helmet, but other than that it looks really close to the rest of the Power Ranger suits. There's concept art for the rest of the suits on Crums' page as well, all with varying differences to how they ended up in the final movie. Before Power Rangers hit theaters, Lionsgate CEO Jon Feltheimer stated that they could see "doing five or six or seven" of the movies. Lionsgate may have changed their tune since that initial boast as the movie underperformed at the box office, but it appears that the record-breaking merchandising sales may end up fueling the sequel. Nothing official has been confirmed, though director Dean Israelite said talks of a sequel are in place between Lionsgate and Saban. The sequel is out of the director's hands, but could very well end up being made on the strength of Blu-ray sales in addition to the other merchandise that has been flying off the shelves. 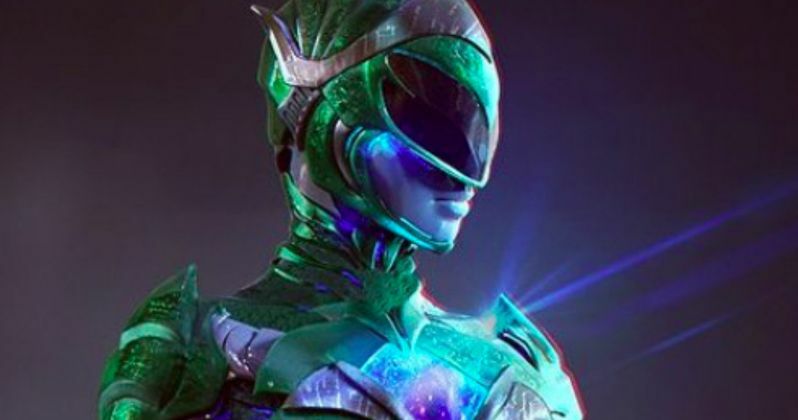 Lindsey Crums' concept art may very well be the best look that we get of Rita's Green Ranger suit, but it might not be the end of the Green Ranger if the sequel ends up happening. Tommy Oliver was the Green Ranger on the television series as well as the first movie. His return has been teased as returning to the Power Rangers. Only time will tell if we see Mr. Oliver return to the Green suit, but for now, fans should go buy all the merchandise they can if they want to see said sequel. Check out Crums' incredible concept art below.